It kind of sounds like Maroon 5 and Fall Out Boy were chucked into a blender with Awolnation or some equivalent and the result was just poured directly into my ear without any processing other than the blending. It's certainly interesting and definitely has potential to grow, but I think I'll still end up preferring Take Me Over. A definite step down from 'High' and 'Take Me Over', but still a somewhat enjoyable track from Peking Duk. Still better than 'The Way You Are'. 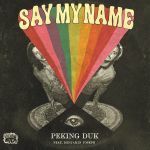 I am a Peking Duk fan and this is a nice return from them.<br>Good track. Can see it being popular at festivals. Doesn't do much for me although a little better then previous efforts. Nervige Musik, mit der ich fast gar nichts anfangen kann. I've always found this really annoying considering it's a really rocking affair.<br>Film clip was a savior though.